Feed a Bee is an initiative to help bees thrive and increase food sources for honey bees. 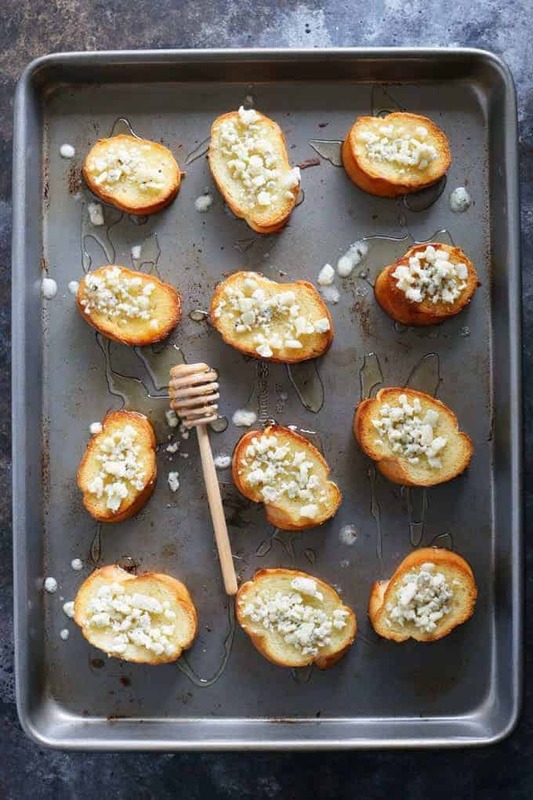 Also, an easy honey blue cheese crostini recipe. Disclosure: This post is sponsored by Crop Science, a division of Bayer, but all opinions are my own. With a blog named Honey and Birch, you can imagine that I have a fondness for honey. What you might not know is I also have a great love for honey bees and other pollinators. 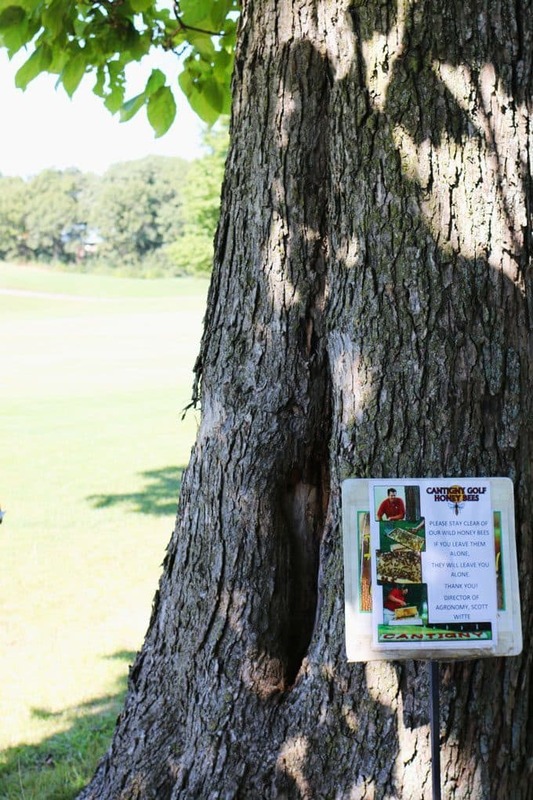 Last week, I attended a Feed a Bee event at Cantigny Golf Course in Wheaton, IL to learn about Bayer’s Bee Care program. The day consisted of a tour of the Cantigny grounds, a hands-on cooking class and information on how I (and you!) can get involved with the Bayer Bee Care Feed a Bee program. 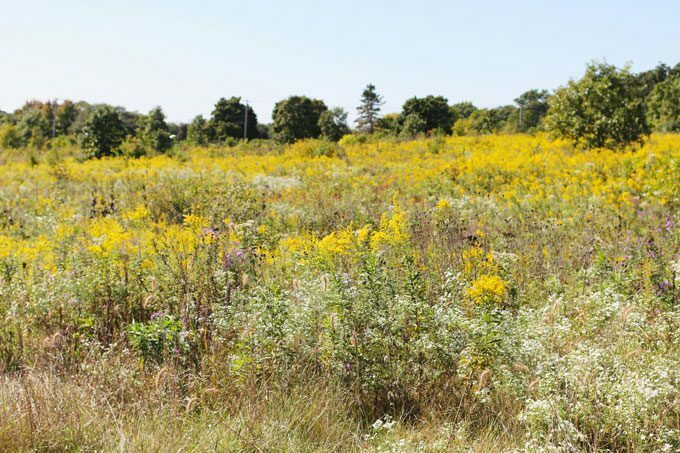 Cantigny has made a great effort to pair the manicured grounds of their golf course with the native prairie plants to become a haven for bees and other pollinators. As we went on our golf cart tour, we visited areas set up specifically for the honey bees. 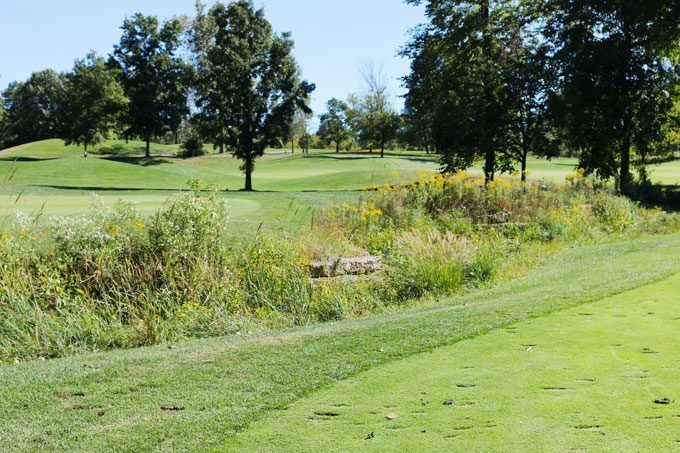 Cantigny’s Director of Agronomy, Scott White, has worked very hard to develop these natural areas all around the course grounds. They are so close to the golf course that we had to speed away a few times so as not to get hit by golf balls. Cantigny is a participant in the Bayer Feed a Bee program. 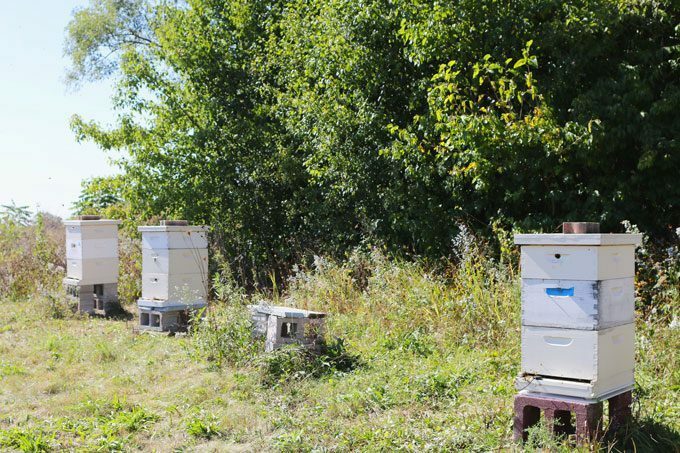 It has two wild bee hives in addition to two areas with multiple managed hives. The course’s regular golfers have come to welcome the resident honey bees if they see them on the course. Bees are so important to our ecosystem. One-third of all food eaten by humans is dependent on pollination. Bees help pollinate many of the fruits, nuts and we vegetables we eat including apples, cherries, almonds and pumpkins. Did you know honey bees visit up to 5000 flowers in a single day? That’s a lot of flowers. Bees must visit about 2 million flowers to make a 1-pound jar of honey. I’m sure you have heard that the bee population is in trouble – this is actually not true. 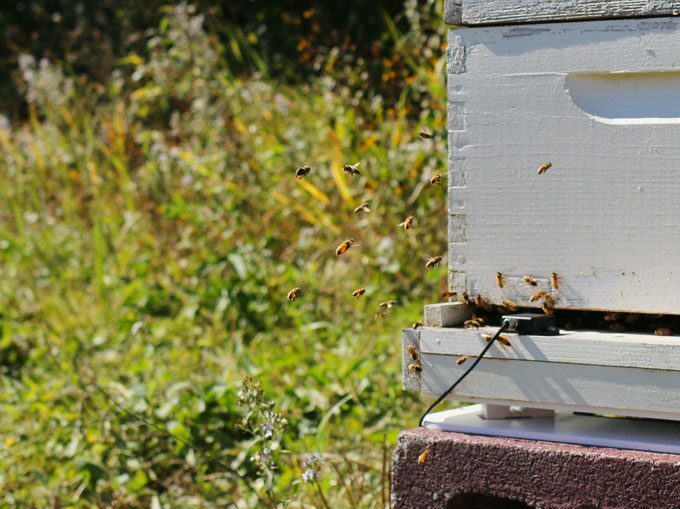 Hives populations are incredibly stable right now and are in fact growing. What bees need help with is finding food sources and staying healthy; there are more than 20 diseases that impact bees. That’s where Bayer comes in. For more than 25 years, Bayer has been working towards finding solutions to keep bees healthy and fed. Feed A Bee has been one of their major initiatives to increase food for honey bees and the other polinators. By collaborating with orginations such as Cantigny, Feed a Bee helps provide pollinators with the food they need to survive and thrive. Join the Feed a Bee inititiave by visiting www.FeedABee.com and request that Feed a Bee plant on your behalf or commit to plant a bee-attractant plant on your own. Share your planting photos using #FeedABee on Twitter, Facebook, Instagram and Tumblr. Visit www.beehealth.bayer.us/feed-a-bee to see more planting tips and how-to-videos. This summer I started turning my yard into a haven for bees and other pollinators and I plan to continue this fall and next year. Please join me and Feed a Bee by working together to help bees thrive! Thank you to Crop Science, a division of Bayer, for sponsoring this post. 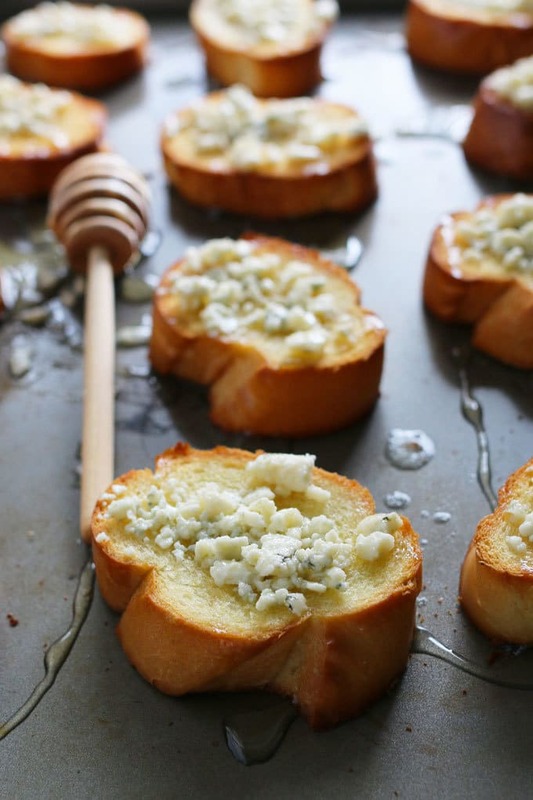 I love an easy recipe and this honey blue cheese crostini really fits the bill. I made it with some honey from Cantigny but you can use any honey. However, I do have to say the honey from Catigny was delicious! Pre-heat your oven and then grab a loaf of French bread. Cut it into slices and brush a little olive oil on the slices before you toast toast them in the oven. When you take the toasted bread out of the oven, place blue cheese on top and sprinkle honey all over it. 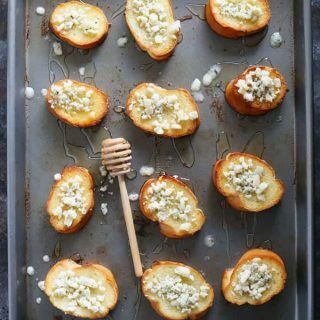 An easy honey blue cheese crostini recipe - a perfect appetizer for parties! Preheat oven to 375. Brush both sides of the french bread with olive oil and place them on a baking sheet. Bake each side for 3-4 minutes, until each side is golden brown. Place blue cheese on top of each crostini. Sprinkle honey liberally on top of the blue cheese. My yard is full of Bees Bliss, literally. It is the common name of one of the native salvia I have. Great recipe and great post!! Sorry it took so long to visit – I’m a tad behind!! Thanks for sharing at the What’s for Dinner link up! Yes, please! Love this crostini! Thanks for linkin’ up with What’s Cookin’ Wednesday!